As a podcaster, I’m going to tell you all about the 5 podcasts I’m loving at the moment. This topic was inspired by one of our listeners. A creative spark that I can apply to my work or life, or a podcast that makes me laugh or think. I tend to hit the subscribe button if (after listening to 2-3 episodes), the podcast brings me one of those things. Hosted by Megan Febuary, Founder and editor-in-chief of For Women Who Roar™. This is a digital and print magazine featuring the voices, experiences, and art of women. Recently, I connected with @forwomenwhoroar via Instagram. I appreciate the powerful, uplifting content they put out into the world. I especially loved the Feb 28th episode called You are More Than Enough. I highly recommend giving it a listen. Especially if you’re wrestling with something, and need a little inspiration to break through a block in your life. Hosted by Ryan O’Neal, this podcast is EVERYTHING to me right now, it’s sooooo good! This one was recommended to me by my photographer friend, Bradford Martens. Bradford and his brother Henry are super-talented wedding photographers. Their work is magical and otherworldly. It makes sense that an artist like Bradford listens to a podcast like this… it’s beautiful, epic and captivating. Ryan is a singer-songwriter, and on this podcast he’s created a song for each of the nine Enneagram personality types. He highlights one song per episode as part of Atlas project. It’s fascinating to hear Ryan’s creative process of producing the songs, and layering in hidden audio tracks as ‘fingerprints’. He interweaves expert knowledge about the sacred Enneagram by interviewing Chris Heuertz. If you’re just learning about the Enneagram (like I am), this is the perfect introduction to what it’s all about. Plus, I’m guessing you’ve heard Ryan’s music these last few years, but just didn’t know it. His work has been featured on Grey’s Anatomy, Twilight, So You Think You Can Dance and more. It’s beautiful. It’s gripping. And as a #2 on the Enneagram, it makes me cry every time… but in a good way. Give it a listen. Hosted by Johnny and Colin. In contrast to The Sleeping at Last Podcast (which makes me cry), Alright Mary makes me laugh out loud every. single. darn. Time! If you love RuPaul’s Drag Race as much as I do, you’re gonna love this podcast. I watch the TV show, then I watch ‘Untucked’. And then I eagerly await Alright Mary to come out with their episode every Monday to unpack what we just saw. Gender roles, misogyny, and how people relate to each other is something I’m fascinated with right now. And this podcast really helps me to see things differently in life. Plus, the fact they named the podcast after ME (yes, I’ve co-signed that fantasy!) is pretty epic, as well. Alright Mary? Alright Mary. These two guys are such a delight to listen to and queen-out with. They are smart, funny, and such good eggs. Their laughter is infectious, and their kindness brings a smile to my face. They’re responsible for the side-eye I get on the train when I bust out laughing listening to them every time. Go ahead and hit subscribe now… you’ll thank me later. Hosted by Nikki Elledge Brown, this one is great for moms with young children, who are also tackling building a profitable business. I met Nikki recently at the Be Sage Conference, which we both spoke at, earlier this year. On Naptime Empires, Nikki shares her real-world insight on motherhood and running a business from home (while your kiddo takes a nap). She has expert knowledge on communications, and shares simple tips on how to use your real voice online. She’s a self-proclaimed ‘Word nerd’ and she’s got a certain knack for writing copy. Plus, I like how Nikki shares what’s working for her right now… and what isn’t. Check out the latest episode How to Come Back After a Break. This is especially if you’re feeling a bit of shame or ICK after taking a break from something in your business. Hosted by Amber Lilyestrom, a super smart branding strategist. Amber tackles business challenges with a soulful approach. A guest of The Simplifiers Podcast, Carrie Montgomery, recommended Amber to me, way back in episode 017 of the first season. Amber inspires me to take bold action steps forward in my business, and helps me to link it to a higher purpose. I especially loved her recent interview with Mark Neko on What Opens Us to Authentic Living. It sent chills down my spine when I listened to this episode. It’s full of profound wisdom that you can apply both to your work and to your life. 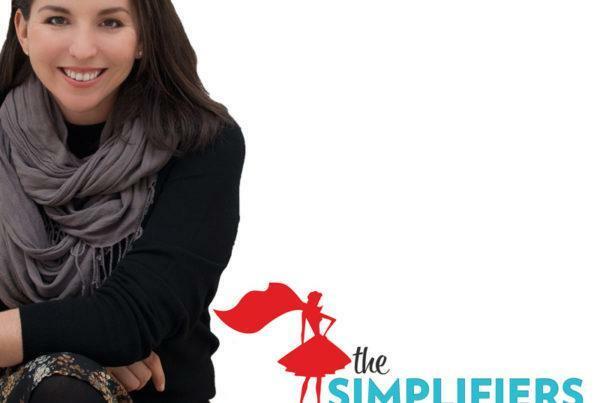 If you like The Simplifiers Podcast, you’ll also enjoy Amber’s podcast as well. We’re like soul sisters, super aligned in the work we put out in the world – have a listen! Whatever you’re listening to these days, let it sink in. Whether it’s soulful or silly, deep or just makes you laugh, give yourself this gift. Try a couple of new podcasts out this week. See what inspires you. And hey, tell a friend about one of your favorite podcasts. It’s like giving people the keys to a castle they didn’t even know was open to them. If you’re reading this right now, you know how powerful podcasts can be to change your mind and change your life. Share your own recommendations about The Simplifiers Podcast too. Especially if the episodes have offered a creative spark, or a new way of thinking. If they’ve made you laugh, or made you think. And then you serve the world. Thanks again for tuning in, showing up and giving your best, each and every day. So tell a friend about your favorite podcast and let’s make a positive impact on the world, together.